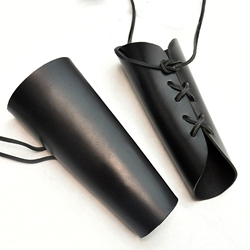 These basic leather arm bracers are crafted in, high quality 7-8 oz (1/8 inch) thick leather. The leather cords secure the bracers to the forearm and can be widely adjusted to fit a large range of forearm sizes. Great for Renaissance Faire, Stage productions or LARP.